Saratoga, elevation 6,792 feet, is nestled in Wyoming's North Platte River Valley. The Continental Divide sits to the west and the Snowy Range mountains to the east. The town is famous for it's mineral hot springs pool, excellent fishing, abundance of wildlife, and many outdoor recreation opportunities. You can take the kids to Kathy Glode Park for a picnic and playtime on the playground. Swim in the Municipal Pool, open from late May to early September. 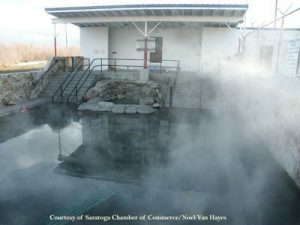 Or after a busy day, rest your aching bones in the mineral hot springs, affectionately known as the Hobo Pool. The Pool is open 24 hrs/day, every day of the year. It's free to the public, and the bathhouse has showers and restrooms. There's even a "not-so-hot" pool, perfect for younger kids and those who just don't care for really hot water. Another interesting spot for families is the Saratoga Museum, housed in the town's original c.1915 Union Pacific RR depot. Exhibits let you explore the Platte Valley and view one of the state's largest and best gem and mineral displays. See the museum's website for hours and more information. The beautiful Platte Valley Community Center, located in Saratoga, offers a variety of events, many of which are kid-friendly. Check out their calendar of events when coming to Saratoga. What's the West without cowboys and horses? 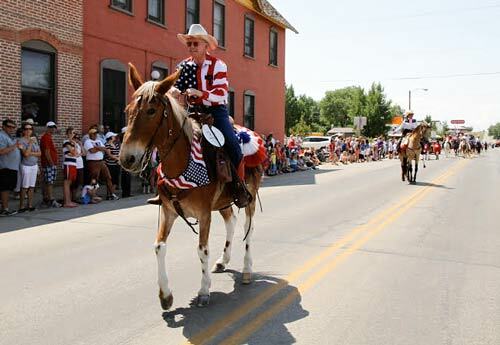 The Platte River Rodeo Assn. can point you to the buckin', ropin' and ridin' events as they come to the Buck Springs Rodeo Arena in Saratoga, and other rodeo happenings in the area. Summer activities center around outdoor sports of all kinds -- from hiking to rafting -- and autumn is hunting season. Winter is welcomed by cross country skiers, snowmobilers and snowshoers. The North Platte River is the premier Blue Ribbon Wild Trout Stream in Wyoming, with over 3,200 catchable fish per mile. It is also one of Wyoming's best rivers for float trips, ranging from leisurely drifting to whitewater thrills. The one public river access point in town is approximately four blocks from the Hotel Wolf. 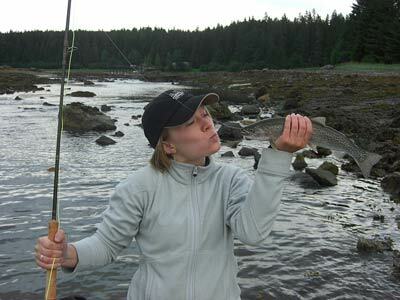 Anglers will also enjoy the many nearby lakes and streams that also provide excellent fishing. Saratoga Lake, High Savery Reservoir and Hog Park Reservoir are the most prominent stillwater fisheries within a short drive from Saratoga. And if you have a taste for ice fishing, don't miss the Annual Saratoga Lake Ice Fishing Derby in Jan. Youngsters and adults compete in separate categories for cash and other prizes. Southern Wyoming is teeming with wildlife. Hunters have plenty of nearby access for big game hunting: Pronghorn antelope, mule deer, white-tailed deer, elk and moose all call the region home. Hunting season begins each September; get info from Wyoming Game and Fish here. Wildlife photographers can capture images of these larger animals, as well as pictures of bald eagles, egrets, and many other species of birds and small mammals. Take the kids for a drive through the area to spot some of our local wild creatures. 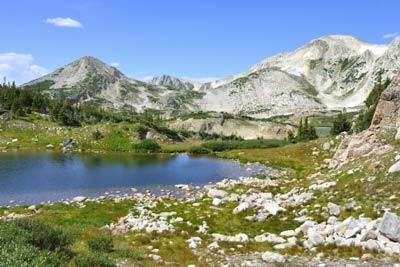 The Snowy Range and Sierra Madre Mountain Range are part of the Medicine Bow National Forest. Visitors travel here year-round to fish, hike, hunt, mountain bike, ski and snowmobile. The Snowy Range Scenic Byway, Highway 130, is one the area's highlights, showcasing some of the most breathtaking and easily accessible peaks in the Rocky Mountains--including famed Medicine Bow Peak (elevation 12,013 ft). It is open from Memorial Day through October (weather permitting). Drive less than a half hour drive south of town on WY-30, and you're in the town of Encampment, which rests at the base of the Sierra Madres. There, a hearty population of roughly 500 souls will welcome you to such attractions as the century-old Grand Encampment Opera Hall, where at least twice a year you can catch a melodrama that will entertain the whole family. The Grand Encampment Museum is a collection of historical buildings filled with artifacts. Every Father's Day, the Wood Choppers Jamboree and Rodeo comes to the Encampment Rodeo Grounds -- a whoopin' and choppin' good time for everyone. 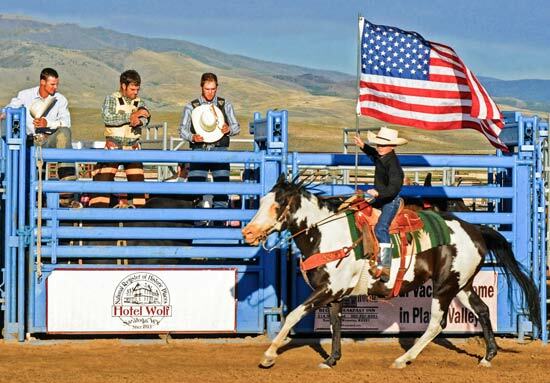 And on the 3rd full weekend in July, the Grand Encampment Cowboy Gathering Outfit brings ranchers, musicians, poets and writers living in the area together to promote and preserve cowboy culture and lifestyle. If you love cowboy poetry, don't miss this event. Be sure to check local weather conditions before traveling. More visitor information, including local event descriptions and dates, is available from the Saratoga/Platte Valley Chamber of Commerce.